which sugar should i luse, light brown sugar or rock sugar? It's better to use light brown sugar. Sure, you can bake them into muffin size. Adjust the baking time then. If you use cake flour, it would be more fluffy. Hi ! if i didn't add cinnamon can or not? By the way, I have tried many of your other recipes! They are great and thanks for sharing so many nice recipes. There's raising agent mixed in self-raising flour already. 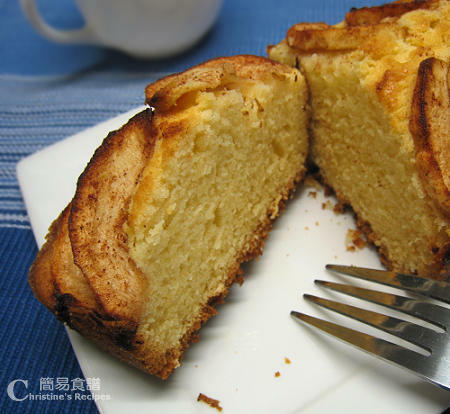 If the cake rises too quickly while baking, you can decrease the temperature of your oven. Have you try using green apple? I wonder would it be tastier? I love your receipt, I always made it for my family. I have few question regarding this apply cake, Do i fold in the egg or use the electronic mixture to mix it? Also, when I try to mix the butter and sugar, it doesn't come out creamy. I already let the butter in room temperature for 3 hours. And last what kind of sugar you use? I am not sure what is caster sugar mean, is it regular sugar we use daily? Because in US, we either use confectioners powder sugar or superfine sugar for cake and drink, and then regular sugar for cooking. Need more patience and take time to beat the softened butter and sugar until creamy and pale in colour. 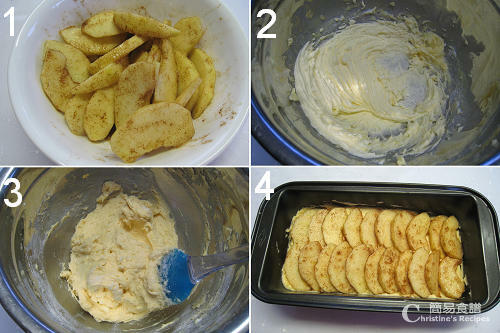 This step is to help you bake soft cake. Caster sugar is super fine sugar, not powdered, but granulated. When folding-in the batter, just use hand whisk or spatula.